The University of Texas System Board of Regents on Monday authorized spending up to $4.5 million to prepare a bid to operate Los Alamos National Laboratory, a key part of the nation’s nuclear weapons complex. The spending vote was not a surprise, as the board encouraged its staff last month to explore development of a bid. The regents still would have to vote again before submitting a proposal to the federal government to operate Los Alamos, which is tucked into the mountains of northern New Mexico. The UT System, partnering with Lockheed Martin Corp., lost a bid to operate Los Alamos in 2005. The system later joined with the Texas A&M University System, the University of New Mexico, the Boeing Co. and Battelle Memorial Institute in a failed bid to run Sandia National Laboratories, also based in New Mexico. Sandia and Los Alamos are part of the Energy Department, whose current secretary, Rick Perry, is a former Texas governor [Note: Considering the history, that's why this fool's errand is HILARIOUS]. A bid to run Los Alamos, which has 11,200 employees and a $2.5 billion budget, would be a quest for the prestige, the opportunity for national service and the legacy that attach to the institution charged with ensuring that the nation’s nuclear weapons would work as intended, without actually detonating them. Running the lab wouldn’t necessarily be pure glory, though, because mistakes could damage the UT System’s reputation [Note: Gee...ya think?!?]. 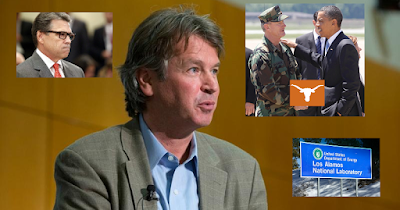 Industry partners, and perhaps academic partners, would be part of the UT System team, and UT-Austin would have a key role, officials have said. But unlike the previous bids involving the UT System for Los Alamos and Sandia, the system would be the lead player if it goes forward with the initiative. What the [REDACTED] is DON Huffines thinking?! ?